On September 29th, I went to BarCamp Buenos Aires, my third BarCamp. I posted a brief 2500-word trip report to “kragen-journal”, a sort of mailing list pretending to be a blog, and I’m reposting a lightly edited version of it here at Chris’s invitation. This is my third Bar Camp, and the smallest and shortest one I’ve been to so far, but in some ways, also one of the most inspiring. Went to Bar Camp Buenos Aires today. Quite a number of surprises. It was at Microsoft Buenos Aires, which appears to be purely a marketing organization, except that it has a server room with some Compaq rackmount equipment in it, apparently to impress visitors. I spent most of the first hour or so just watching other people socialize, due to feeling too shy to talk to them myself (in Spanish, which I still speak poorly). Here’s the schedule as I wrote it down; it’s missing a couple of bits and probably has misspellings. Business 2.0 (Aksavalesky/ eze calviño) Ciencia 2.0 (sbassi + vgonzales) Comunicación 2.0 (J.M. Valentini) Blogs testimoniales Sobre Salud ¿Un nuevo uso de los blogs? There were sticky nametags for people and various A4-size tags for labeling things. There are lots of bits of tag humor; one chair, identical to all the others, was labeled “SILLA COMODA”, which means “comfy chair“. And there were several people wearing tags like <PABLO> on their chests with a corresponding </PABLO> tag on their back. One guy, who I guess was completely empty, had a “<Julian/>” tag. During the first talk slot, I flitted between the Microsoft marketing talk (which was disguised under the rubric of “users as developers”, but seemed to largely consist of demos of proprietary Microsoft software), a Telefonica talk that I couldn’t hear very well, a talk on valuation of startups according to options theory (which, naturally, featured the Black-Scholes equation), and a talk on “Management 2.0”, which mostly seemed like a bunch of standard Cluetrain platitudes, but which were so radical to one woman in the audience that she was circling her finger next to her temple. I leaned in and said, in Spanish, “Is it too obvious?”. Her eyes went wide. I laughed and stood back up. There was a big sheet of butcher paper on one door labeled, “TAG CLOUD”, with some permanent markers provided nearby for adding tags. Before the first set of talks, it said only “WEB 2.0”, right in the center. In order to express my fears that this was going to turn into a sponsors’ marketing session — Microsoft in particular — I added a large tag covering much of the top of it, saying, “Softwarelibre”. By the end of the day, it was covered with tags in all different sizes and colors. I spent some time talking with the psicofxp.com team, which, if I understood correctly, runs a set of ad-supported web forums with half a million users, all with five employees. I think they were all there at the conference. The employees, not the users. The second talk slot I spent entirely listening to the “Science 2.0” talk by Sebastian Bassi and Veronica Gonzalez. It was largely about the open-access movement in science; Bassi was wearing a PLoS Computational Biology T-shirt. The talk was somewhat sparsely attended, which surprised me, since the other concurrent talks sounded pretty lame from the titles. Three of them had “2.0” in them. The level of geek humor, and all-around geekiness, was comforting and reassuring. There was definitely a distinct Argentine flavor to this — many of the women wearing jeans and T-shirts were also wearing high-heeled boots, 95% of everyone was skinny, button-down shirts were common, many of the male presenters wore sports coats over their T-shirts, and people packed quite near one another in crowds, not hesitating to bump and nudge a bit when passing through — but it was comfortingly familiar. I didn’t see anybody wearing a tie after I got past the guards downstairs. It was uncomfortably familiar in some ways, too; it was about 90% male, 98% white, and very focused on making money. There was a much higher level of marketing folks here than at the Bar Camps I’ve been to in the past, and the talk schedule above reflects those interests. I only saw real technical content in 4 of the 12 talks I attended. (Obviously I missed part of most of those talks.) Two out of the 28 talks were about SEO, and I think they were well-attended. After the first couple of sessions, we had lunch (I mean, “<FOOD>”), which consisted of shish kebabs and sandwiches. In another Argentine touch, these were all heavy on the meat (the sandwiches were pebetes with either milanesa or matambre) and, in several cases, I saw abandoned skewers whose owners had eaten all the meat and left all of the vegetables. The lunch was brought in by a catering company, which served the attendees. I didn’t see any of the caterers in any of the talks, nor did I see any of them signing up to give talks, and I can only assume that they didn’t feel welcome to do so, even though they must have had at least an hour of idle time in between the two major breaks. After lunch, I went to the “Wikimedia Argentina” roundtable session, which unfortunately consisted largely of a couple of people complaining about how the Spanish Wikipedia was not very open to contributions from new users — their contributions were likely to be deleted without any kind of due process — and one person complained of the class system within Wikipedia. Then there was the “Usability 2.0” talk, in which I had a chance to hear different people’s varying ideas about what “Web 2.0” meant (for the fifth year in a row — thanks a lot, Tim) and how AJAX affects usability. It wasn’t as interesting to me as it sounds, but the room was packed; there were 12 seats around the meeting table that occupied most of the room, but 39 people in total in the room. After the break (“<BR/>”) I saw a bit of two talks, one about “Parlamento 2.0” (in which Eduardo Betas, the speaker, said that 30% of the representatives from Buenos Aires have blogs, if I understood correctly) and one entitled “Sociedad, Estado e Internet. ¿Un nuevo mundo?” which largely consisted of a very excited Manuel Guntin expressing great enthusiasm about certain community web sites, for reasons I wasn’t quite able to grasp. It was very entertaining, but I think he would have had to speak a little slower for me to find it really informative. No doubt the native speakers were following him without trouble. In Betas’s talk, I saw a book entitled “Casos Destacados.com”, which is a series of case studies of Argentine internet entrepreneurs. It looks sort of like an earlier, Spanish-language version of “Founders at Work“. The question sparked quite an energetic discussion, which I took no further part in, because I wasn’t sure I wouldn’t be repeating something someone had just said that I hadn’t quite understood. But it was interesting to listen to. I reluctantly skipped out on the end of the talk to see the tail of Maximiliano Firtman’s “Mobile Web 2.0” talk, where he discussed the web-browser and future RIA platforms available for cellphones. I have the impression that the talk was excellent, but I can’t remember many specifics. For the next and final talk, I went into the next room to see the “AJAX vs. FLEX vs. AIR vs. Silverlight” talk by the same guy, which went into some depth. AIR is the new name for Adobe Apollo, and Silverlight is the new name for WPF/E. I was kind of hoping for more in-depth coverage of XUL and OpenLaszlo, but he just sort of mentioned them in passing a couple of times. Still, overall it seemed like a very nice overview. The four meeting rooms branched off the corners of a square central area that contained the food and was not really big enough for 150 people. It probably wouldn’t have been big enough for 75 Californians, unless they were the kind of Californians who hot-tub regularly with new acquaintances, but even with the reduced personal-space requirements of Argentinians, the conversations tended to spill out a bit. Having this central space connecting the rooms, rather than a thin linear hallway, seemed to be an enormous boon to the traditional hallway track. It was the most active hallway track I’ve ever seen, often with more people in it than any of the talks. Fortunately, the meeting rooms had really excellent sound-dampening properties, despite having no visible sound-dampening features aside from heavy wooden doors. It was often quite difficult to hear the speaker when the doors were open to let someone in or out. Afterwards, about 30 of us went out to Café La Barra nearby, which was somewhat noisier than the Microsoft office, so I had a harder time hearing conversations. After a couple of hours of beer and snacks (during which I accidentally learned what “¿te gusta el chorizo?” means), we were splitting up the bill, and Beatrice arrived. I started getting tired enough that I would occasionally fall back to English during the bar time — a fault I hope to correct soon. We finally headed out around 23:00, which means that I’d been either socializing or stressing about feeling too shy to socialize for the past 12 hours continuously. I hadn’t gotten a lot of sleep the night before (I think I slept roughly from 4 AM to 10:15 AM) and so the obvious next thing to do was to walk for half an hour to get to another party at another bar. So we walked to San Telmo near the Tanguera Hostel to go to a CouchSurfing meetup. I was feeling great! After another hour and a half of socializing (mostly in Portuguese with a Brazilian tourist, who was delighted to find someone who spoke her language in Buenos Aires, however slowly — I think I was talking at about 50wpm instead of a normal fluent 300 — but she’d been feeling entirely dependent on her trilingual traveling companion while here) the music got loud enough that it was time to go home. Now I have 20 new people’s names, mostly with some contact info, written down in my notebook, plus another 10 business cards of people I met. Hopefully, I can remember what I talked about with all of them and what they’re interested in. I probably could have established contact with more people, but this is already an increase from my usual level. Maybe I should see if I can get to know these 30 people a bit more first, to see if they are too many to get to know at once. They include several of the organizers of the Bar Camp, plus apparently a substantial cross-section of the web industry here in Argentina — developers, marketers, managers, entrepreneurs, and a journalist, working at big mass-media companies, outsourced web development shops, community web sites, hosting companies, training companies, Google, and others. I met lots of people from Buenos Aires itself, but also people from Mar del Plata and Rosario. There was, as far as I can tell, zero overlap between this group of people, who mostly use Firefox on Macs and seem to live in Twitter, and the CaFeLUG group I’m more familiar with. There are acquaintanceships, but I seem to be the only person in common between the two groups. All in all, Bar Camp Buenos Aires was a tremendous success. None of my fears came to pass. Another aspect that made us have a great feel after BarCamp is that we were able to maintain the original BarCamp structure as both Chris and Tara had written with concerns about. 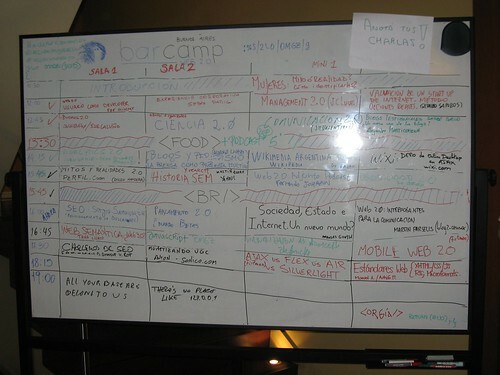 « BarCampBlock: Immortalized in a Scrapbook!